An “offshore company” is generally understood to be a corporation registered in a “tax haven” – low-tax or zero-tax country. Tax advantages, however, are by no means the only benefit to registering an international business enterprise in a jurisdiction like British Virgin Islands. A typical modern offshore company is a private corporation which is exempt from tax, suitable for virtually any international business activity, has a flexible organizational structure, is not subject to excessive accounting and reporting requirements and maintains certain level of confidentiality with rather limited information available to general public. The BVI offers all of these benefits – and more. In 1984 the British Virgin Islands adopted International Business Companies Ordinance which marks the beginning of its success as an offshore financial services jurisdiction. 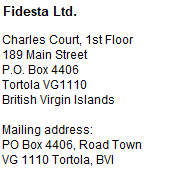 Since that time the BVI offshore company has attained a model status in the offshore services industry. Since then BVI has been by far the most popular offshore tax haven with the greatest number of registered offshore companies among all the offshore jurisdictions in the world. Such is the dominance of the British Virgin Islands as an offshore corporate domicile, that in many regions of the world International Business Companies are called simply as "BVI's". In 2005 the BVI introduced a further development in its corporate legislation by eliminating any discriminatory differences between international business companies (offshore companies) and domestic companies. All the companies in the BVI whether they operate locally in the BVI or internationally outside the BVI are registered in the same Register, regulated by the same law, all have the same rights and the same tax regime (tax-free). This is a great advantage as it is harder to determine whether a particular company is actually "local" or "offshore". By virtue of its legal and commercial reliability, constant and proficient modernization of corporate legislation and prompt reaction to global changes, BVI has retained a well-deserved reputation between the offshore jurisdictions. As far as offshore business jurisdictions go, BVI is clearly a premium “brand”. BVI has an independent judicial system based on English Common Law. Laws and regulations are routinely developed in consultation with the private sector. Offshore financial services sector contributes a very significant part to the country's gross domestic product. Therefore, an inherent and pronounced interest exists both with the government and with the general public to maintain and develop the country's status as a competitive offshore jurisdiction. BVI Business Companies do not have an obligation to prepare or file financial accounts. However, records must be kept that are sufficient to show and explain the Company's transactions; and will, at any time, enable the financial position of the Company to be determined with reasonable accuracy. The information required to be kept includes the records and the underlying documentation which means all sums of money received and expended by the company and the matters in respect of which the receipt and expenditure takes place, all sales and purchases of goods by the company and the assets and liabilities of the company. Such records do not have to be kept in the British Virgin Islands and the location for keeping the records can be freely determined by the owners of the Company providing the Registered Agent with a written confirmation of the respective address. There is no requirement whatsoever to file or otherwise make public any commercial or financial information of the Company. Likewise, there are no auditing requirements. BVI is one of the few offshore jurisdictions where bearer shares are still permitted. Nonetheless, the legislation has substantially restricted the advantages of bearer shares and effectively negated their original principle – free and anonymous circulation. Bearer shares – while still theoretically available - have in fact become rather similar to the registered shares, just more cumbersome. Bearer shares may not be issued to their actual owner as it used to be in the past century. Instead they must be kept in custody of a licensed custodian in the BVI, or with such custodian outside BVI, together with a written indication as to the actual identity and address of the owner of such shares. No transfer of bearer shares is valid until the new owner is properly identified and the respective identification and address documents provided to the custodian of the shares. The government registration fees in respect to BVI Business Companies also clearly discourage the bearer shares in the structuring of BVI Business Companies – those fees are considerably higher. Finally – and perhaps the biggest obstacle of all – is the fact that most (if not all) banks are absolutely averse to accept any companies with bearer shares permitted in their Articles. There is no requirement to specify the operational objects of the BVI Business Company in the foundation documents of the Company (Memorandum and Articles of Association). However, the company may choose to do so, as a specific type of a "restricted purpose company" is envisaged by the Business Companies Act. In order to register a company in the BVI, each beneficial owner, shareholder and director will be required to provide detailed information including legalized copy of identification document and proof of address to the Registered Agent and keep this information updated at all times. Information of the beneficial owners and shareholders stays confidential at the office of the Registered Agent. The Register of Directors is filed to the Registrar, but it does NOT become publicly available. The only publicly available documents of the companies are the Memorandum and Articles of Association, but these normally do not contain any indication as to the actual shareholders, directors or the beneficial owners of the company. However, in the modern world, almost all the countries have associated in common fight against international crime and fraud. Information sharing between the countries is inevitable and becomes more automatic and widespread each year. The few countries that do not cooperate are excluded from participation in global finance or face severe restrictions on international financial operations. BVI has always quickly reacted to the changes in the global trends to retain its excellent reputation and impeccable name in the finance sector. It means also more dedicated participation in information exchange. Nonetheless, any information is disclosed only strictly according to the procedure set forth in the respective laws or international agreements. Only limited amount of information is disclosed and NO information is disclosed to the countries that are not part of such agreements with the BVI. Generally, two types of agreement are the most common basis for information sharing – Tax Information Exchange Agreements (TIEA) concerning tax matters and FATCA for USA residents or CRS for the residents of the countries committed to the CRS concerning banking information. Regarding TIEAs, the BVI has these agreements in force with more than 20 countries, including USA, UK, Canada, China, France, Germany and others, you can find full list of such countries here. Information sharing according to these agreements is NOT automatic and the requesting party must follow complicated procedure to obtain it. It must identify the suspected person and demonstrate realistic grounds for believing that the requested information is held by the BVI. No information is disclosed based on mere suspicions of tax evasion. The disclosed information may not exceed the requested. So, basically it means that the BVI can only confirm the information that the foreign Government already has in its possession and would not provide any additional information. As for the banking information, it is shared automatically strictly according to the procedures specified in the FATCA and CRS regulations. Here you can find more information about FATCA or CRS. The directors of a BVI Business Company may appoint any person (including an existing director), to be an agent of the Company. Subject to the Memorandum and Articles of Association such agent has such powers and authority as the directors may prescribe, except that no agent shall have no authority to amend the Memorandum or Articles; to appoint directors or agents; to approve a plan of merger, consolidation or arrangement; or to make a declaration of solvency or approve a liquidation plan. After the incorporation, a BVI Business Company must pay the renewal fees every year to continue its legal existence. The minimum mandatory fees include Government renewal fee, Registered Agent fee (covers also the Registered Address) and Compliance fee for regular document verification of the beneficial owners, shareholders and directors of the company. Apart from the fees above, other professional fees may be payable for the Company management and administration depending on the services you have ordered (third-party director/board member, shareholding/share custody, company secretary, business address, call handling or any other services). These services are optional. All fees are listed in full detail in our Schedule of Fees. The annual fees are charged once a year following the renewal payment schedule of the BVI Company Registry. All the companies registered from January to June must pay the annual fees by the end of May every year starting from the next year after the company registration, and the companies registered from July to December must pay the annual fees by the end of November every year starting from the next year after the company registration. If the company fails to pay any of our service fees, we will resign from providing the respective services to the company. The company will stay liable for any services already provided. In case the Government fees are not paid, the penalty fees will apply according to the BVI Business Companies Act. If the company has not paid the renewal fees and/or the late penalty fees, the company name will be struck off the Register. Once the company name is struck off, the company cannot do any business and deal with its assets. Restoration of the company name to the Register is possible, however quite costly procedure. USD 450 for Company with up to 50,000 shares, with or without par value. USD 450 for Company limited by a guarantee or an unlimited company without shares. USD 1200 for Company with more than 50,000 shares, with or without par value. USD 7500 for a Restricted Purposes Company.